It’s been a while since I posted anything here, and that’s about to change (’cause, y’know, this is a new post and all). So, here it is: On October 3, the new book drops! 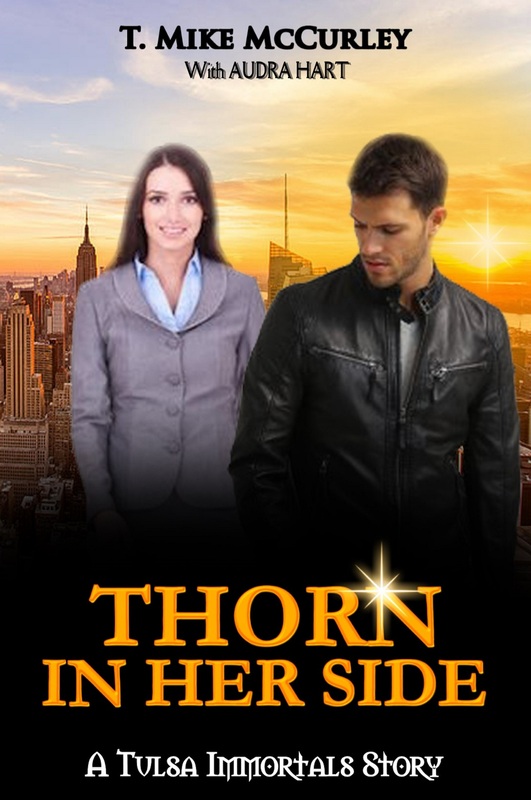 Thorn in Her Side is book #8 in the Tulsa Immortals series. Created by Audra Hart, the TI stories tell the tales of a group battling supernatural threats while hiding in plain sight as the Twin Ravens Motorcycle Club out on the back roads of Tulsa, Oklahoma. The Twin Ravens include vampires, witches, shifters, demigods, and even a dragon or two. Each of them fights to protect the world from darkness, but also to find their own little bit of happiness at the same time. Penned by Audra herself, as well as the amazing talents of Elaine Barris, A.M. Halford, and now yours truly! Zak Thorne is a sorcerer. He’ll gladly tell you he’s not a good one, or that he only knows parlor tricks. If you ask, he will conjure up a tiny flame to light your smoke, or a breeze on a hot day. He’ll even cool off your beer for you, as long as you’ve got a spare one for him. His abilities far outstrip what he will reveal, however, and the smart-assed spellslinger known in the MC as Thorn will soon need them all. Today is Hallowe’en, and for Thorn, that’s the worst day of the year. It’s the anniversary of the brutal murder of his family, and the memories drive him deeper into the bottom of a bottle to hide from the pain of the past. As if that isn’t bad enough, he wakes up to find out that his one night stand isn’t what she seems, that there are bounties on his head for his past behavior, and that the day is just going to go downhill from there. Lori Dane is the one bright spot in Thorn’s existence. His best friend since they were old enough to know what best friends were, she’s blossomed into her own kind of power. Lori handles the legal matters that crop up for the Twin Ravens, which is not a small list. When it comes to Thorn, though, she has her hands well and truly full just dealing with his attitude. When life throws a new set of curves at the pair, they’ll have to come together as never before to escape, and Thorn’s revelations under fire will strike him with all the subtlety of a sledgehammer. Will he finally figure out what he’s been missing all these years? Thorn in Her Side is available for pre-order now, and will drop on October 3rd. Get your copy reserved today! Click HERE for the link! Find more delightful reads by Elaine Barris! Dig on the sultry works of A. M. Halford! Read up on the tasty tales of Audra Hart! Also, click the LINK for more Tulsa Immortals goodness!